In our third episode of the Perfect Puppy Training Series we talk about how we go about teaching puppies to accept and enjoy having their nails trimmed. 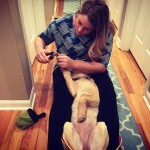 We see a lot of adult dogs who are afraid and stressed out when having their nails clipped. We’ll show you how we go about introducing puppies to having their nails clipped in a relaxing and positive way which allows us to prevent that fear from developing in the first place and instead raise a dog who tolerates and hopefully even enjoys having their nails trimmed. Check out Episode #3 in our Perfect Puppy Training Series below. We can help you to raise the perfect puppy into a dog that you will enjoy for a lifetime.